KEAAU – Hilo High’s girls served noticed on the rest of the Big Island Interscholastic Federation by winning the highly competitive Kamehameha-Hawaii Invitational this past Saturday. 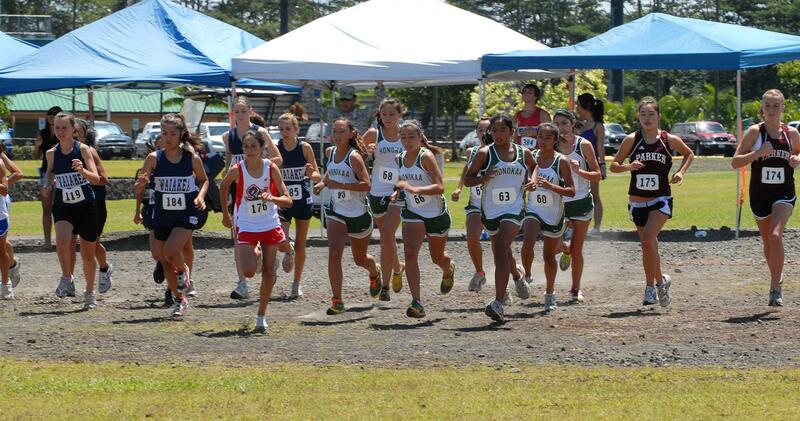 Led by senior Nadia Ramirez the Viking girls stood up to a talented field of harriers which included a team from Hawaii Baptist Academy on Oahu to capture the biggest team victory of their young season. Hilo won in team scoring with 45 points followed by HPA with 57 and HBA, who finished sixth in the state last year, with 69. 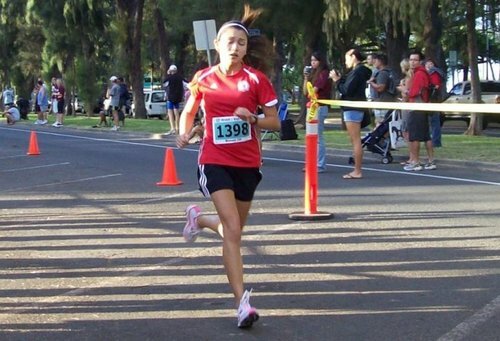 Ramirez, who transferred to Hilo earlier this year from a school in California, made a name for herself at the all-schools meet on the Warrior campus by becoming the first BIIF girl to cross the finish line. 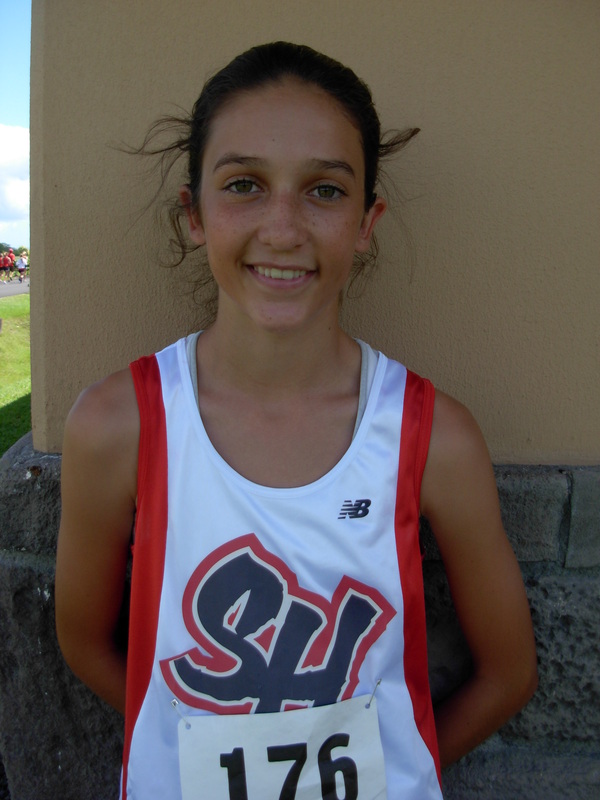 Winning the meet was freshman Dakota Grossman from Seabury Hall on Maui. Grossman’s older sister was an MIL champion and a state runner-up during her senior season last year. Grossman, who is already considered to be one of the top five runners in the state, went out quickly and led the entire way. Within the first mile of the three mile race Grossman had already established a 30 second lead on her closest competitors, Ramirez and HBA’s Heidi Nicholls. Grossman’s winning time of 19 minutes 15 seconds was nearly one minute ahead of Ramirez, 20:08, and HBA’s Nicholls, 20:16. Three time defending BIIF champion, Honokaa’s Tialana Greenwell, was fourth in 20:34. 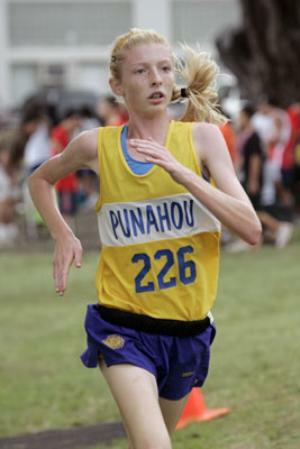 It was only the second time in Greenwell’s illustrious cross country prep career that she had lost to a BIIF competitor. 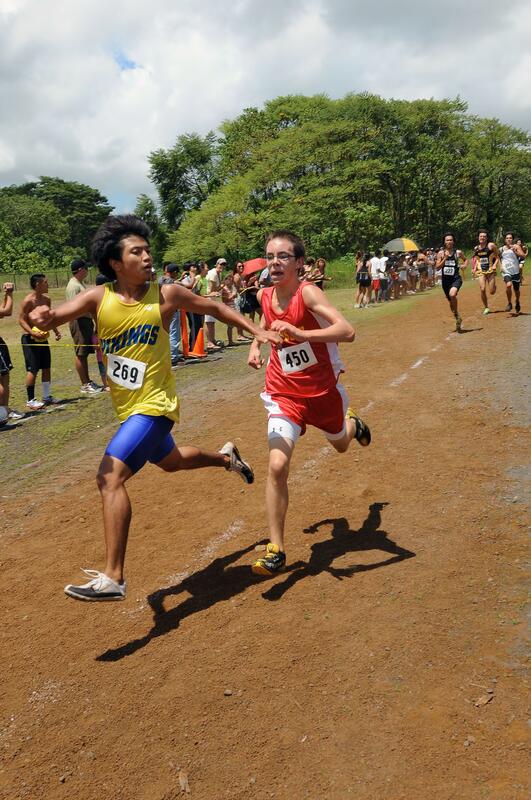 For the boys varsity competition it was the season debut of BIIF defending champion Chris Mosch from Honokaa. Mosch had missed the first two meets of the season as he was still recovering from a stress fracture he received at the end of the track season in May. Mosch left nothing in the tank as he went out quickly and jumped to an early lead with Rene Siqueiros of Watsonville, California in hot pursuit. “Going into this race I had my sights on winning and I was hoping to run in the low 17 minute range,” Mosch said. With 400 yards to go and with the finish line in sight Siqueiros began his kick and started to close on Mosch. With 200 yards Mosch had slipped into second with Siqueiros hitting the tape at 16:43 and Mosch following two seconds later. “I didn’t think I’d do this well, time wise, especially in this heat,” Mosch said. “I knew I was in shape, cardio wise, as I never stopped conditioning after the injury. I was doing pool running and biking nearly every day and I was looking forward to this day for a long time. Dragon teammate, Joshua Robinson, also had a good day claiming fourth overall in 17:23 and helped his team to take second in scoring, just two points behind the winning Watsonville team. Mosch and Robinson went 1-2 in the all BIIF meet which places Honokaa as the team to beat once again in island competition. Also looking very strong was Christian Liberty Academy’s Jordan Grotenhuis who finished fifth overall and third amongst BIIF runners, edging out Hilo’s Tyde Kaneshiro and St. Joseph’s Andrew Langtry. The BIIF will take a bye this coming Saturday and will resume with an all-schools meet on Sept. 25 on the campus of Waiakea.